1. Black equestrian-type knee-high boots. 2. Brown pants with yellow accurate Corellian bloodstripes. 3. Black shirt with Mandarin-style collar. 4. Yellow jacket with ribbed sleeves, beige trim down center front, beige stripes down front. 5. Accurate gun belt and holster with octagonal buckle. 6. Hair should be worn in a loose bun atop the head. Naturally occuring color only, no bangs. 1. Black leather or leather-like material, medium-sized messenger bag. Flap should fold over the bag. No visible buckles or clasps. 2. Blonde wig styled in the appropriate hairstyle. 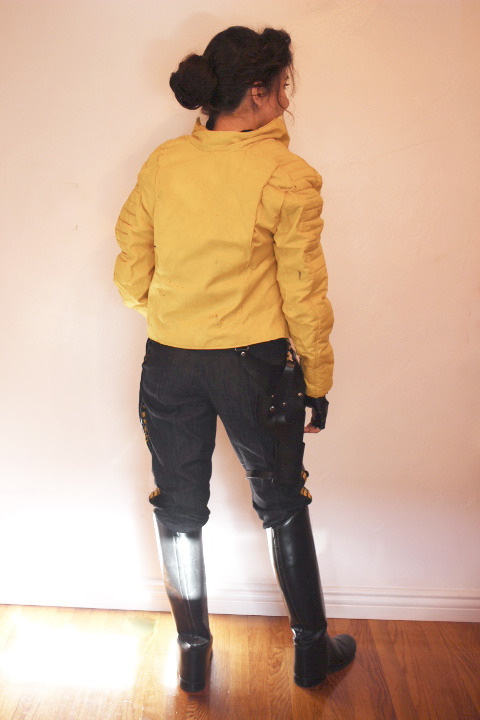 Here is my Marvel's Princess Leia (2015) Evaan Verlaine Travel Gear build. Jacket is quilted on the arms, and has a single layer of batting for some puff to add dimension and weight but maintain the more streamlined look that it has in the comics. By contrast, the reference Ceremony Luke jacket is much bulkier. The jacket is made of sports wrinklease that was tea dyed to have the more muted gold as shown on the comic covers, it is fully lined and weathered. Jacket back has gussets, although I have some issues with drafting them in and they are too narrow to keep closed properly. Shirt is black cotton with Mandarin collar and long sleeves. 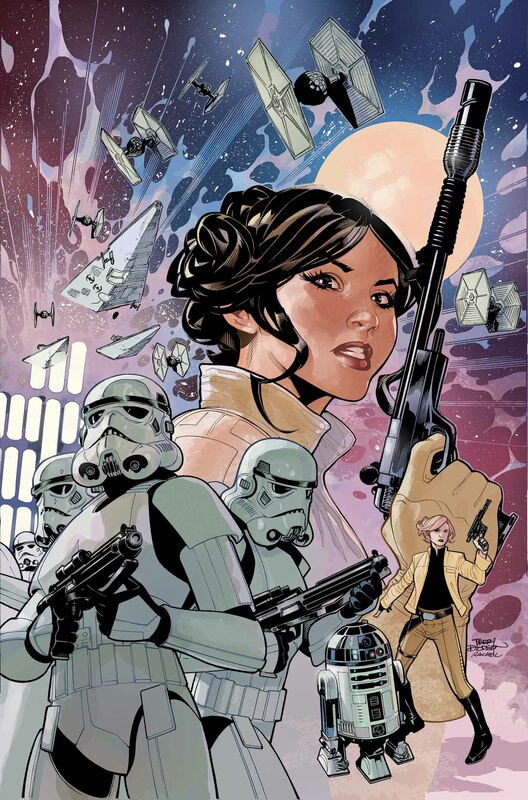 Pants are only shown as brown on the variant cover as listed in the above quote, in the comic book they are colored black as well as in the Force Arena mobile game that Evaan appeared in. As such, I went with black and I am hoping that this will help distinguish from being a "Rule 63" Ceremony Luke. Pants are black stretch denim with felled seams down the center front and back. 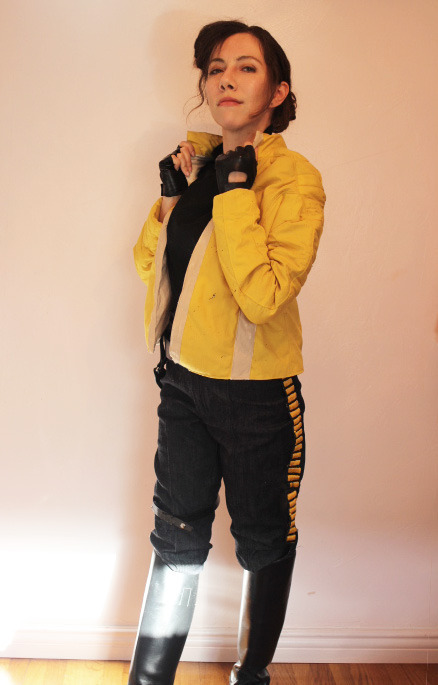 Golden yellow hand embroidered Corellian bloodstripes are on the side seams. Y drop black leather holster and black belt are from Darman's Props on Etsy. Evaan either wears it high across her waist, slung across her hips or sometimes a with across her hips with a second belt in the loops of her pants. The art is very inconsistent on this and I am not sure what to interpret as. 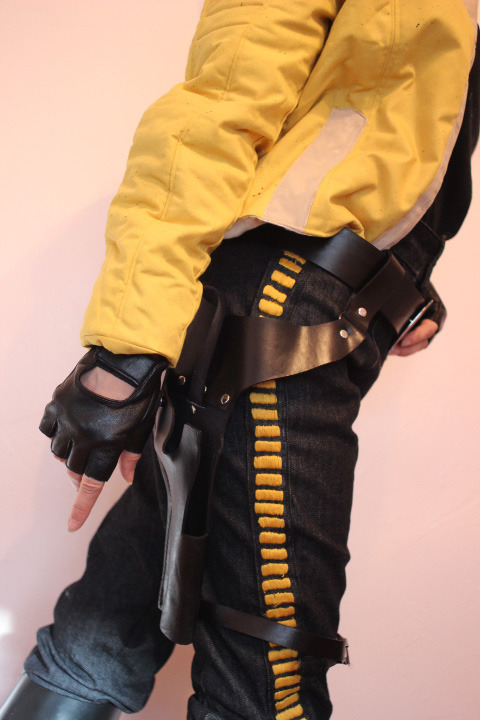 https://instarlightss.tumblr.com/post/171432223372 for reference to image with double belt. Gloves are leather with cut out on the back of hand and velcro strap closure. But I don't think that this is a pilot costume, heh heh! This is probably a fringe costume. To be honest, I was not sure where to classify it either. Evaan is listed as a pilot in the Gold Squadron and listed as Gold Three in the Battle of Scarif and Yavin. I thought that would make it a pilot?? Or is it not because it's not a flight suit? I saw a quote from the artist that this design with the coat and pants was used as the artist thought it was dress uniform for pilots. Are there any references of other pilot characters wearing that outfit? If so it could probably be accepted as a formal dress pilot, if it's clear that it is formal dress for a pilot (like the formal dress outfit in the X-wing and Rogue Squadron comics). Otherwise, no, I don't think this costume would be approved for a pilot because there isn't anything that's recognizable about it being a pilot. It would probably fit better in Fringe if she's the only pilot character seen wearing that outfit. This is as much a pilot outfit as Luke's ceremonial outfit, Bespin fatigues or Jedi Knight clothes (and he's also X-Wing pilot "Red 5")...this belongs into fringe. It's from this thread here. However the post itself is from Tue May 05, 2015, and it does not say in what category the costume would fall into When I searched for any other active threads regarding Evaan nothing else came up. Good news is that I got an update on my application and it's been moved to Alliance Officers. If possible, can a moderator move the thread for me?